Who doesn't know Suelas? With a stylish variety of shoes you can flatten, fold, and roll, they've become the working/traveling/commuting/clubbing woman's essential. I own a pair of Suelas myself, and they've saved me from many a painful commute when I was living in NY. I'd carry my party heels in my hand and walk to the subway in my Suelas, and when I arrived at the bar, I'd slip them either in my clutch or coat pocket. Yep, they're that handy! Puntera Lazo Blue, P999. So girly! I'd probably be wearing this a lot with my collection of pussybow blouses, and slim pants. Manejo Perfore Deep Sea, P1,099. The pointed toe is a bit different from most of their rounded styles, but I think it's what makes the Manejo so sophisticated! I'm also excited for their Laureen Uy collaboration, which should come out within the next two weeks. Check back on their website and Facebook for updates. Exciting! We all love a good DIY, but let's face it, not all of us are creative, or have the time or inclination for it. Thankfully, entrepreneurial artists like Debbi Baybay, of Pimp My Shoes, are around to satisfy our need for unique fashion. 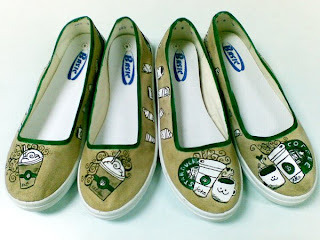 Debbi hand paints canvas flats and plimsolls with your chosen design. Since she does not replicate designs (unless specified by a buyer), you're assured a one-of-a-kind shoe. The shoes are quite affordable, ranging from P1,200-1,400. 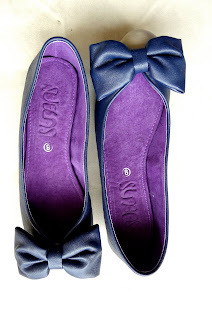 If you provide your own pair, the customization will only cost P500. Admittedly, I am not a sneaker type of gal, but I wouldn't mind wearing these zebra-striped plimsolls. Starbucks flats. 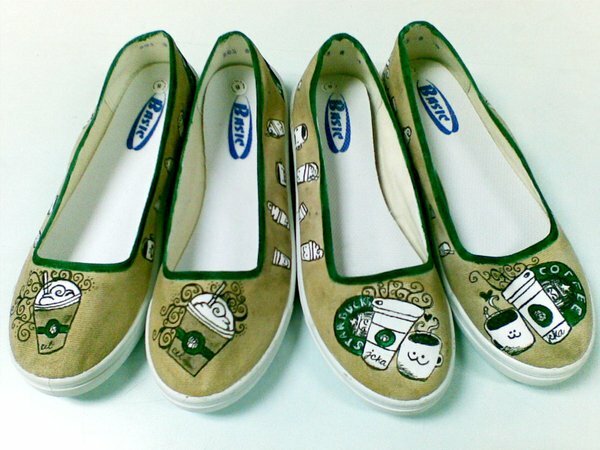 For caffeine junkies who like to wear their loyalty on their feet. 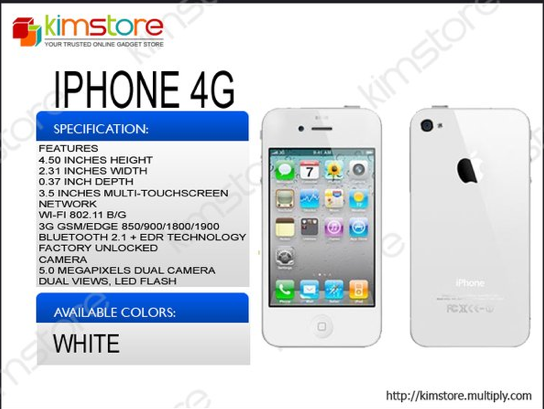 I am seriously considering getting an Iphone 4 and once I'm ready to make the purchase, I will probably be scouting on Kimstore. I would normally be iffy about buying expensive gadgets at a local online site, but Kimstore has managed to build a strong reputation as a reliable reseller, having been featured in Entrepreneur magazine, and even winning GoNegosyo's Young Starpreneur Awardee for 2011. 16GB for P28,500; 32GB for P32, 200. 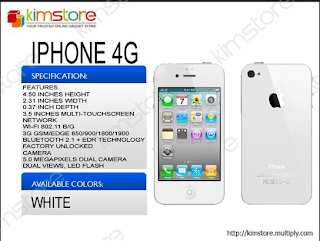 Kimstore sells an assortment of gadgets, from Apple products to digital cameras, DSLRs, lenses, mobile phones, gaming consoles, tablets, and media players. Based on the reviews I've read, her prices are pretty competitive (often even cheaper than buying at the mall), and her quick service has been lauded. Kim can even deliver within the day as long as an item is in stock. And she offers a one year warranty for her products (subject to terms and conditions). One photographer I know confirmed Kimstore's reliability, saying that he bought his sister's camera from this site. I love my flip flops. I love them so much that I've managed to destroy about three pairs of Havaianas already. The latest disaster happened in Boracay two months ago, resulting in poor me walking through D'Mall barefoot in search of cheapo replacement slippers. 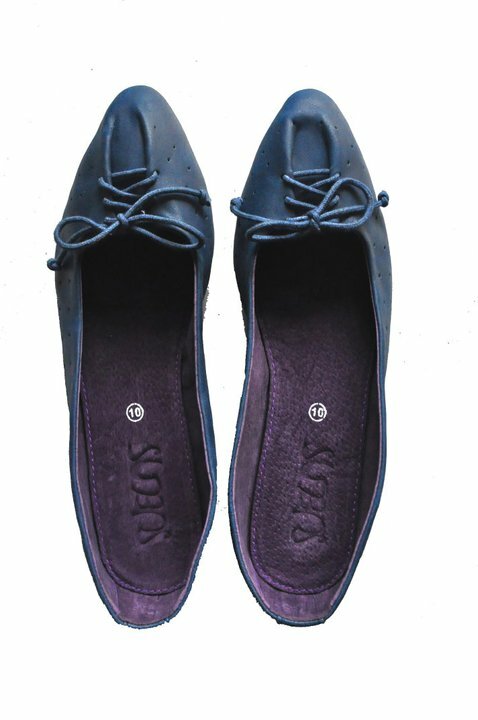 I was desperate enough to buy a chaka pair, thinking it would only cost me P200 max, but *gasp*, it was priced at P450! I was flabbergasted. Ganito na ba kamahal ang tsinelas ngayon? Now if these studded Yessahmine flip flops were available, I wouldn't have hesitated to purchase a pair. I like the faceted stud embellishments, which are stylish but minimal enough not to be OA. But for those who like fancier flip-flops, Yessahmine also sells beaded and beribboned styles. Hot Fashion Wear specializes in affordable Korean and Japanese styles. While most styles are for pre-order, HFW has a collection of ready-to-ship pieces. My top picks? For my next ShopSpotting post, I'll be sharing tips from Jackie Tan, co-owner of Suelas, on how to promote your online store. Till the next ShopSpotting! 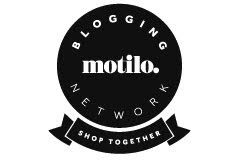 For online sellers who want to be part of ShopSpotting (and have the chance to win a cool P50,000), register now!